A joint venture involves two or more businesses pooling their resources and expertise while starting a business. The ownership, operational control, profits, risks and liabilities of the enterprise are all shared as per the joint venture agreement. This makes the JV agreement a key roadmap document that will decide how to start the business and grow it. It also becomes essential in case an existing business is seeking corporate investment to grow, and if subsequently there are differences between the partners involved in the venture, if one or more of them want to divest their stake, and/or if the JV needs to be dissolved. All of this needs to be explicitly laid out in the joint venture agreement. But before we do that, let’s take a minute to understand how joint ventures work. A Joint Venture may be a new business with shared ownership by two or more existing businesses, or it may be a contractual agreement between two or more parties to work together for the pursuit of a single project or projects of a specific type that all the parties are interested in. There are therefore two types of joint ventures – equity based and contractual. The latter does not require the creation of a new and separate business entity. The parties involved merely enter into a JV agreement to work on a project. One good example of this is a franchise chain operation, wherein the franchise owner and franchisee enter into a joint venture agreement for just this one project, while both businesses will continue to carry on their other work individually and separate from each other. However, an equity-based JV requires the parties involved to pool investment and other resources into a new business entity that must be created. For example, a foreign company establishing a new business in India may do so as a joint venture in partnership with an Indian partner business. This fulfills the requirement of Indian businesses who need investment and technology transfer from overseas JV partners who are global brands, while also meeting compliance requirements for FDI investments by foreign companies who want to start a business in India. Selection of a good local partner is the key to the success of any joint venture. 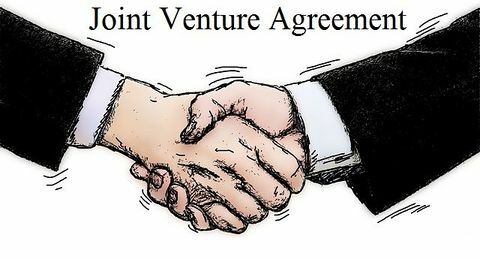 Once a partner is selected, a Memorandum of Understanding (MoU) or a Letter of Intent is signed by the parties that lays out the basis of the future joint venture agreement, and also serves as an indicator of each party’s firm interest in participating in the joint venture. The MoU and subsequent Joint Venture Agreement must be drafted by corporate law experts who are well versed in both the business law in India as well as international and multi-jurisdictional laws and procedures. There is no special set of rules or laws for joint ventures, but here’s a checklist of things you need to do for entering into a joint venture agreement and subsequent formation of the business. MoU – Who are the parties involved, what is the nature of the business to be conducted under the JV, and what geographic territories it will cover. Parties agree to form JV subject to feasibility studies. JV agreement – Type of firm, capital required, sources of funding, shareholder stakes, contribution of intangible assets, etc. Also includes details about an exit strategy in case one or more parties wants to exit or dissolve the venture. Registration of the company and and Articles of Association. Selection of nominee directors on behalf of shareholders. Selection of location for doing business.